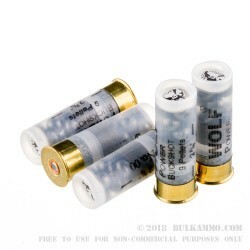 Priced cheap and nicely positioned – this 12 gauge buckshot from WOLF with the potent 1 1/8 ounce load features a 9 pellet payload in a 2 ¾” shell. 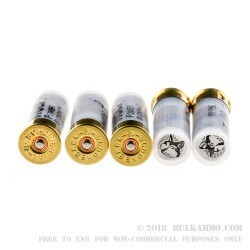 It delivers performance unlike most other low priced buckshot defensive and hunting rounds. The price is ultra-competitive. The high base (brass) and the distinctive clear hulls showcase this double ought (#00) buck shot appropriately for your quick visual understanding of what is in or ready to go into your shotgun. 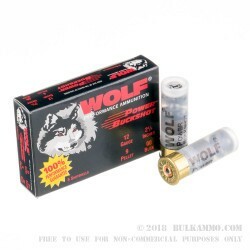 Wolf made a name for itself with extremely reliable steel cased ammunition for military style and surplus rifles (mostly in 7.62x39 and 7.62x54R and 5.56/.223). Their almost legendary reliability with their ridiculously low cost price point made them a very popular cult brand in America that all the sudden went mainstream when a majority of shooters had realized that the risks of steel cased cartridges to the chamber and bore of their favorite rifles was non-existent. This #00 buck load is a perfect option for field use on large game including the largest deer. It is also an excellent option for home defense where you have decided that a shotgun is your defensive weapon of choice. A: Hello! Wolf lists this 9 pellet 00 Buck as having a velocity of 1325 fps.